Want to come to the Garden? 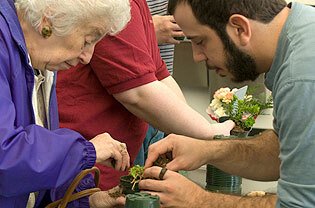 Bring your group to participate in any of our engaging Therapeutic Horticulture programs. Or customize the experience by having a Missouri Botanical Garden horticulture therapist collaborate with you to define the therapeutic goals for your group and develop a plant-related program here at the Garden. To register your group or if you have questions, please contact the Supervisor of Therapeutic Horticulture at (314) 577-9473 x 76526. Drawing on the sights, smells, textures and sounds, visitors of all abilities can enjoy all the Zimmerman Sensory Garden has to offer. Explore with a trained horticulture therapist the many benefits and uses of a sensory garden. During your tour, experience various plants using all your senses and take home a plant list of some our favorite sensory plants. Preregistration is required; prime season is mid-May through October. This program is specially designed to serve caregivers of all sorts, including nurses, social workers, non-profit employees and more. Employers can send their staff to receive therapeutic programming that proactively helps to build resiliency. Through nurturing oneself, people are better equipped to then care for others. Preregistration is required. The trained horticulture therapists at the Missouri Botanical Garden can create a program suited to the unique need of each group that visits. You can work closely with our staff to define therapeutic goals and then develop programs using plants and plant-related activities. Learn more about our Customizable Services and refer to our Menu of Services for examples of program options.